All natural foods contain nutrients that are vital to our health. But did you know that how you combine your foods could also influence the amount of usable nutrients you get from your food? According to numerous studies, certain food combinations can help maximize the nutrient power of both foods and give you a powerful kick of nutrients that you can use to keep energized, efficient, and healthy. Cobb salad comes standard with greens, egg, and a few other ingredients. Now, a scientific study published in The American Journal of Clinical Nutrition has found that Cobb salad might just be the healthiest salad. The study authors found that when eggs were combined with the consumption of raw vegetables, the absorption of carotenoids (nutrients that give tomatoes and carrots their color, such as beta carotene and lycopene) increased 3.8 times. 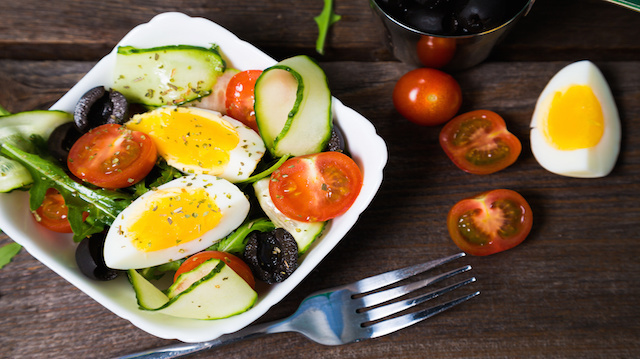 The researchers theorize that the extra fats in egg yolk contribute to the increase in nutrient absorption since a similar effect can be seen when salad is eaten with oil. According to research from Purdue University, the combination of vitamin C (found in red peppers) with beans helps the body absorb the nutrients from the beans. Vitamin C helps convert iron and other nutrients into the simplest form for the body to use. According to a report by professors from Oregon State University, the combination of turmeric and black pepper maximize the benefits of the curcumin found in turmeric. Curcumin is a powerful antioxidant that can fight inflammation and boost the immune system. When pepper is added, a 1998 study published in Planta Medica found that the bioavailability of curcumin present in turmeric increased by 2,000 percent. Nothing goes better with tomatoes than olive oil, right? This combination has been a staple in the Italian diet for thousands of years. But studies have found that combining fat with tomatoes can boost the body’s absorption of lycopene- the cancer-fighting antioxidant. According to a study published in Food Research International in 2012, olive oil was better at maximizing the lycopene absorption rate than any other oil tested. Fish oil was also beneficial. Do you add lemon to your tea? A study from 2007 published in Molecular Nutrition and Food Research found that when citrus juice is added to green tea, it increases the antioxidant power of the tea by up to 13 times. Next time you drink some tea, add a lemon wedge and boost that antioxidant power. According to new studies, the probiotics in yogurt are best absorbed when taken along with prebiotics, which fuel the beneficial bacteria and encourage them to grow. A 2013 study published in the journal Nutrients found that eating fiber along with yogurt was able to maximize the benefit of yogurt’s probiotics. So next time you have a cup of yogurt, throw in some granola or fruit for added benefit. With just a few simple changes, you can maximize the usefulness of the nutrients that you eat. Hey Buddy!, I found this information for you: "Eat This with That: Getting the Most from Your Food". Here is the website link: https://www.thealternativedaily.com/eat-this-with-that-getting-the-most-from-food/. Thank you.